How to add link to email text on a flipbook page? When readers browse your flipbook publications, they may want to give some best advice to you or have some confusion need your help. In this time, they need to know your email address. So, add an email link to some text (for contact) on a flipbook page is necessary. A-PDF to Flipbook Pro software integrates with Page Editor Function. You can easily insert hyperlink (web/email/product link), video, button, images to book pages with this powerful function. Now the below paper will show you how to add email link to flipbook page with A-PDF to Flipbook Pro software. 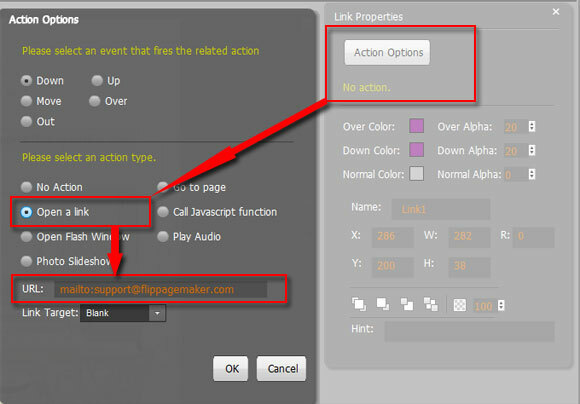 Before following below steps, you should download and install A-PDF to Flipbook Pro firstly.
. move to right side, open "Action Options"
Step4: Save and exit to preview the effect.